Free Kid Apparel | A Savings WOW! 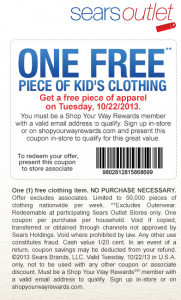 Today, Tuesday, October 22nd, stop by your participating Sears and pick up your free kid’s apparel. Print out this coupon and bring it with you. You also have to use your free Shop Your Way Rewards card to get the free apparel, so be sure to sign up for one if you have not already. It is limit one piece per customer. Limited to 50,000 pieces of clothing nationwide per week. Excludes outerwear.